Commemorate the 50th anniversary of Rev. Dr. Martin Luther King, Jr’s famous Beyond Vietnam: A Time to Break Silence sermon in an evening with Michelle Alexander and Ruby Sales, voices of the past and future of the Civil Rights Movement. 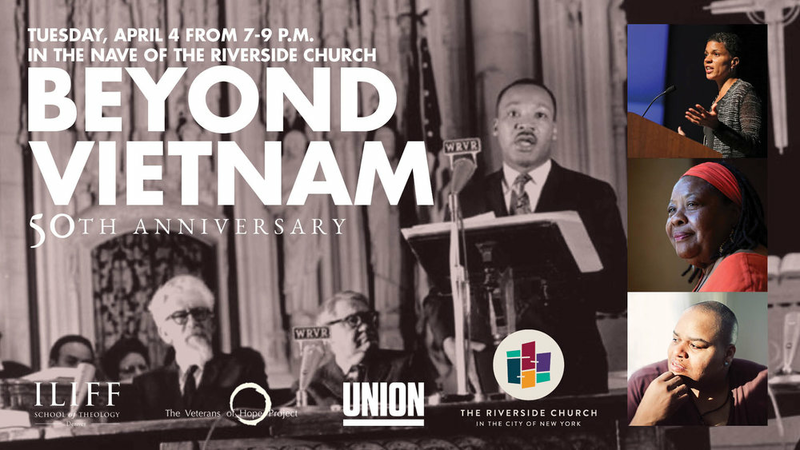 Written by Dr. Vinecent Harding, and delivered at The Riverside Church exactly one year to the day before Dr. King's assassination, Beyond Vietnam is a moral agenda for America to address issues of racial justice, poverty, and war. Dr. King and Harding's prophetic and prescient words are as urgently needed today as when they were first delivered. The evening is co-hosted by The Riverside Church, Iliff School of Theology, Veterans of Hope and Union Theological Seminary. RSVP below. A block of rooms is reserved at the Aloft Harlem for out of town guests.